This is a Bestsellers, Latest and Specials module filtered by the category that is currently being viewed. It falls back to the standard 'global' bestsellers,latest and specials if you are not looking at a category page. All the clever stuff is done in the background, all you do is set the modules and the extension does the rest. It automatically scans for the category that the customer is looking at and selects products from that category to display. If there are no products to display from a subcategory and/or the category is not ‘Top’ then displays the default list. Just work your way through the categories and you'll see it working. 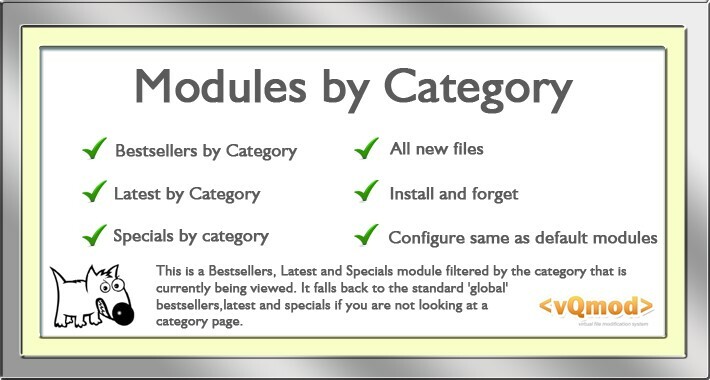 This is completely seperate from the default bestsellers,specials and latest modules and the fallback to the global bestsellers, special and latest products uses its own cache so that you can set a different limit on this module and it won't affect the display of the standard module. It's also been made as a seperate module so that it can be easily modified to fit your theme without disturbing any other modules. No file modifications required - just upload and go.